Going to the dentist for the first time can be scary for little kids, especially if they’ve heard about their parents or siblings talk about cavities or fillings. But with the right care and attitude, you can help your child enjoy going to the dentist and having clean teeth. Here at North Eugene Family Dental, we treat patients of all ages and can help your children feel at peace during their visit. To maintain a healthy set of teeth during your child’s life, it is important to establish healthy dental habits from a young age. According to the Academy of Pediatrics and the Academy of Pediatric Dentistry, your child should first visit the dentist when your child grows his or her first teeth, or when he or she turns one-year-old. 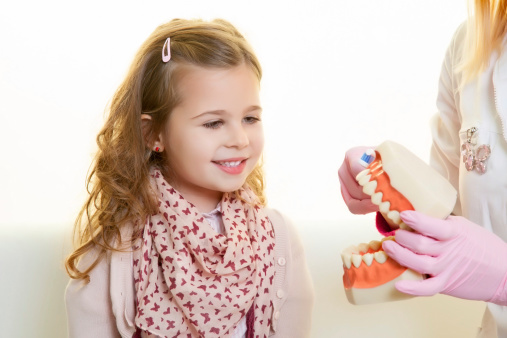 By visiting the dentist from a young age, your child can familiarize him or herself with the dentist and the rest of the team quickly and easily. Plus, going to the dentist regularly from a young age can reduce anxiety and the chance for cavities. There are many books and games for children that are aimed at teaching them about healthy dental habits and visiting the doctor’s office. Books such as Just Going to the Dentist and The Berenstain Bears Visit the Dentist, for example, act as a cheerful and informative look at dentist visits. An app called Duckie Deck With Teeth allows your kids to create a virtual set of teeth with which they can eat snacks, see how dirty the teeth get, and brush the teeth sparkling clean. With cheerful books and games, your kids can learn why going to the dentist is important and be less afraid of visiting. Lastly, make sure to be positive when you talk about the upcoming visit! Don’t use words like “hurt” or “pain” and try to avoid saying statements like, “don’t be scared!” These words can end up scaring your child away. Instead, talk about having clean, healthy teeth with your children. Tell them they are going to meet a friendly new doctor who will help them have strong teeth. While bribing your kids with a new toy or candy can seem effective, this often leads to fear for the kids, as they wonder why a bribe is even necessary. The best way is to keep it short and simple, you don’t have to go into details, and the dentist will be able to explain to the kids in a friendly, easy-to-understand manner. 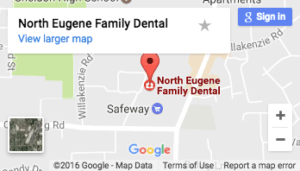 At North Eugene Family Dental, we proudly maintain our friendly, comfortable atmosphere where your children can feel at ease. If you have a child that is ready for his or her first appointment, give us a call today!